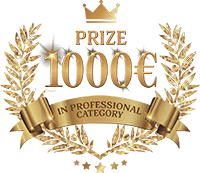 Main prize in Solo classic Professionals category – 1000€ and right to teach at our next edition. The winners of all solo categories will be awarded with medals and diplomas. The winners of group categories will be awarded with cups and diplomas. All the winners and prize winners will be awarded with free full passes and discounts from prestigious worldwide festivals: TBA.